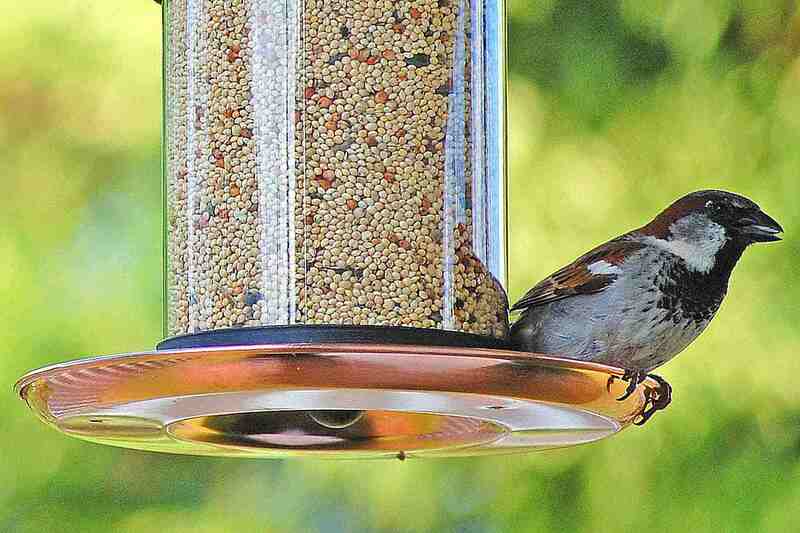 Bird feeding is a wonderful hobby that can bring a diverse flock right to your backyard, but many bird feeding myths can discourage novice birders from putting out their feeders. By understanding the facts, you can learn to disregard these 12 bird feeding myths and enjoy the birds at your backyard feeders. Feeding Birds Makes Them Dependent on Handouts - FALSE! While the same birds may regularly visit feeders as part of their daily foraging, studies have shown that wild birds only get an average of 25 percent of their food from feeders. There are many natural foods birds prefer, and while they will visit feeders out of convenience, they are well able to find other food sources if feeders are unavailable. Feeders may become more critical during harsh winters, but birds will not starve if the feeders aren’t filled. Feeding Birds in the Fall Keeps Them from Migrating - FALSE! Many inexperienced birders assume that as long as there is food available, birds will not migrate. While some birds, such as American robins and bohemian waxwings, are nomadic with relation to food sources, birds that migrate depend on the weather, daylight and their genetic instincts to begin migration. Instead of keeping birds from migrating, available feeders give them a much-needed energy boost to help them survive their long journeys. Rice Can Kill Birds - FALSE! The myth that uncooked rice will swell and kill birds – or in more colorful versions, cause the birds to explode – is one of the most persistent and most false. Many types of birds eat different grains regularly, including rice, with no ill effects, and rice can be a nutritious addition to many birds’ diets. Leftover rice is one type of kitchen scrap that can be safely added to feeders in moderation, and the birds will eat it happily. Birds Will Choke on Peanut Butter - FALSE! Some people refuse to offer peanut butter to birds with the misconception that the sticky treat will become stuck in their bills and throats, killing the birds. This is another complete falsehood, and there is no recorded evidence of peanut butter ever being a problem for birds. Peanut butter is a very nutritious treat, high in calories and fat for great energy. Many birds enjoy peanut butter, including nuthatches, chickadees, woodpeckers, and jays. If you are still concerned about stickiness, blend peanut butter with cornmeal or flour to make it more crumbly. Bread is Perfect to Feed Ducks - FALSE! While bread, crackers and similar products can be fed to birds as a very rare treat, feeding ducks bread exclusively can lead to unhealthy birds and polluted waterways. Bread has very little nutritional value, and too much bread in small ponds and other areas can attract predators, rodents, and other pests. Decayed bread can also lead to diseases that can infect both birds and humans, and ducklings do not get the proper nutrition for healthy growth from a diet of mostly bread. Instead of feeding ducks bread, take cracked corn, fresh peas or grape halves to the local pond. Red Dye Is Necessary in Hummingbird Nectar - FALSE! While hummingbirds are attracted to the color red, there is plenty of red on most hummingbird feeders to attract the birds without needing extra dye in the nectar. While decades ago red dye was found to be toxic to humans and assumed toxic to birds as well, today’s dyes are safe for consumption. Whether your hummingbird nectar has red dye or not is largely irrelevant; they don’t need it to find the feeders, but it won’t hurt them if it is there. But why take the chance? No Birds Eat Milo Seed - FALSE! The large, red milo seeds found in many less expensive birdseed blends are often considered undesirable filler, but several types of birds will eat them. Quail, doves, and sparrows often eat milo, as will other ground feeding birds such as ​wild turkeys and pheasants. If your backyard does not have many birds that will eat milo, however, it is best to choose a mix that does not have a large percentage of these seeds to avoid waste and a buildup of discarded seeds around your feeders. Birds’ Feet Will Freeze to Metal Feeder Perches - FALSE! Birds’ feet are well protected against cold weather, even if they perch on a metal bird feeder. Birds do not have sweat glands in their feet to provide moisture that would freeze to metal. Furthermore, their feet and legs are made up of scaly tissue with low blood flow to minimize cold damage. If you are concerned about frozen bird feet, keep your winter feeders in dry, sheltered areas where they will not get iced over during storms. You Don’t Need to Feed Birds in the Summer - FALSE! There are more natural food sources available during the summer months, including flowers, insects, fruits and natural seeds. These are the same months, however, when parent birds are overworked trying to provide for hungry broods and growing nestlings. Supplemental food from feeders is an easy and convenient resource for many summer birds, particularly when there are more birds around to compete for the same food sources. By feeding birds in the summer, you’ll enjoy many more species in your backyard and will “teach” young birds where to return the following year for a reliable food source. Birdseed Never Goes Bad - FALSE! Like any food, birdseed can spoil over time, especially if it is stored improperly. Seed can attract pests and rodents or become mildewed or moldy, and eventually, old seed dries out and is less appetizing to birds. If you store birdseed properly, however, it can last for several weeks or months and still be suitable for your feeders. Choose a cool, dry area to store seed, and use airtight containers that will deter rodents and insects. When you refill feeders, always check to see that the seed is not spoiled, and discard any unusable seed. Mixed Seed Is a Bad Feeder Choice - FALSE! On the contrary, offering a birdseed blend is a great way to attract even more birds to your backyard. There are many types of blends to choose from, and they may include millet, milo, sunflower seeds, cracked corn, nuts, bits of fruit, dried mealworms and other foods. Choose a mix formulated for the types of birds you wish to attract to your yard, or experiment with creating your own mixed seed specifically for your favorite backyard birds. While it is true that some feeder designs are more squirrel resistant than others, no feeder is 100 percent squirrel-proof. Squirrels are cunning and resourceful, and if the feeder has a seed or food they like, they will spend hours discovering a way to get it, causing significant damage along the way. There are ways to make your feeders more squirrel resistant, however, and over time the squirrels can learn that certain feeders aren’t worth the effort if other foods are more easily available.